I just wanted to let you know that I have received our order and I am extremely impressed with the quality of the frames. I will be recommending your company to colleagues and I will be putting in another order in the new year. Thank you. Snap frames for use on the pavement or any outside/inside location. These versatile snap frame A Boards will get your mesages noticed by passing customers. Available for your promotional posters in sizes A1, A2, A0, 20" x 30" and 40" x 30". 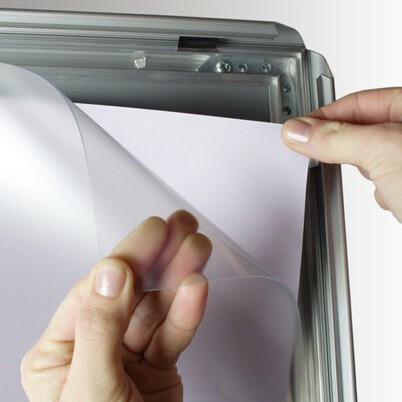 Your posters sit behind an anti-glare protective plasic sheet accessed by the easy-to-change front opening snap frames. Sizes A1, A2, A0, 20" x 30", 40" x 30"
A2 - 420 x 594mm. A1 - 594 x 841mm. A0 - 841 x 1189mm. 20" x 30" - 508 x 762mm. 40" x 30" - 762 x 1016mm. 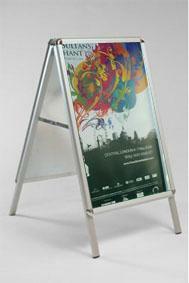 Snap-Frames.com is operated by Graphic Pavement Signs Limited. © Copyright 2013.